Often Ibiza is famous for luxurious yachts and cars and continuous night life, something that interferes with observing the beautiful Mediterranean setting, does not encourage experiencing the flora and fauna of the island to its fullest potential. The proposed area that is set to become the alternative experience from what there is already on the island, on the contrary #mediterranean#journey introduces the different approach to the tourist activities and the perception of the island, encouraging tourists and inhabitants rather to explore the region using bicycles, boats or bare walking via long strips of organized pathways and bridges. 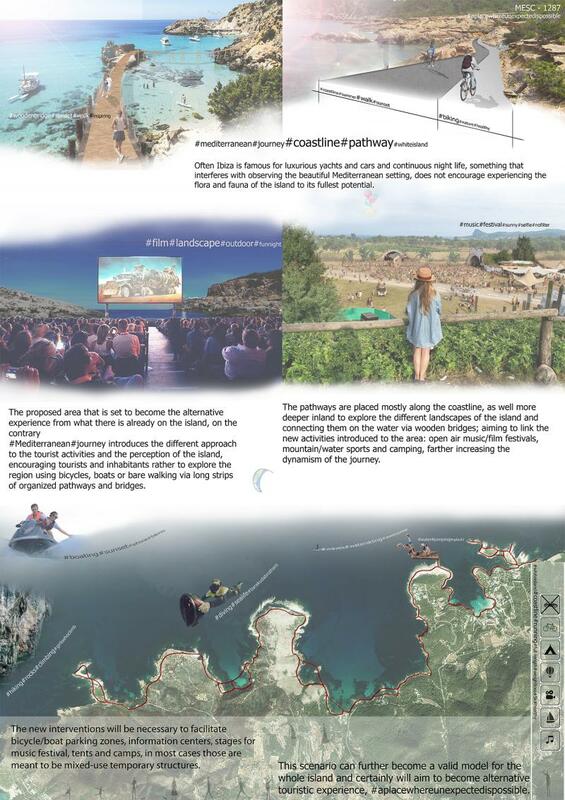 The pathways are placed mostly along the coastline, as well more deeper inland to explore the different landscapes of the island and connecting them on the water via wooden bridges; aiming to link the new activities introduced to the area: open air music/film festivals, mountain/water sports and camping, farther increasing the dynamism of the journey.